On March 4, 2007, at Merkin Concert Hall, Music From Japan celebrated its 32nd year with The World of Joji Yuasa. A self taught composer, Mr. Yuasa started his career in the group “Experimental Workshop” (Jikken Kobo) with Toru Takemitsu and others in the early 1950’s. He has received numerous awards, including those for his radio, television, and film scores. In his composing, he has sought a primordial and universal language that transcends culture. Before the concert Mr. Yuasa gave the New York audience a greater understanding of this language and its development through a pre-concert lecture, The Music and Life of Joji Yuasa, and the concert program, The Works of Joji Yuasa. 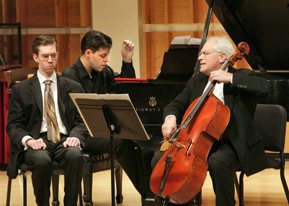 The concert included works from his early years as well as more recent compositions along with a piece commissioned by Music From Japan for the event. The concert program of The Junko Tahara Biwa Ensemble featured selections from The Tale of Heike, a medieval literary work chronicling a pivotal period in Japanese history. Beginning in the 12th century, the tale became part of an oral-musical tradition in which biwa music was interwoven with narration. Ms. Tahara has moved this tradition in a new direction by basing her compositions on Tomiko Miyao’s version of the tale which takes a woman’s perspective on the events of the epoch. The program will also feature instrumental work including a newly commissioned piece by Masataka Matsuo. Ms. Tahara studied Chikuzen biwa under Mikako Yamada and the living national treasure Kyokusui Yamazaki. Since 1972, she has been a principal member of the world famous ensemble Pro Musica Nipponia. 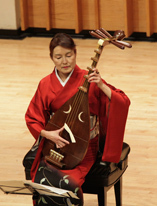 Festival 2007 opened in Washington, DC with the US tour of the The Junko Tahara Biwa Ensemble. The musicians then traveled to Murfreesboro, TN before arriving in New York. Educational programming, lead by Ms. Tahara, accompanied the performances to bring a greater understanding of the biwa and katarimono, narrated songs in Japan’s oral tradition, to American audiences. Barbara Ruch, Director of the Institute of Medieval Japanese Studies at Columbia University and Professor Emeritus of Japanese Literature and Culture, gave a pre-concert lecture in New York City on medieval Japan and the significance of The Tale of Heike. The final performance of the tour was given at the Yasuragi Center in Mahopac, NY.